Since moving to Ann Arbor I’ve been struggling to get back into my exercise routine that I had while in Jackson. I just don’t have the motivation I did when I was taking classes at the Y, so when I found out my coworker Martin was a personal trainer and model I had an idea. We came to the agreement that we would trade services, he’s building his model portfolio and I am trying to get healthier. It was a win-win situation! We started working out back in November and have seen some great results so far. It was time to get in the studio for his photos. The session was a nice change of pace since most of my work is done on location and I got to “play” around a little more than usual which always fuels my creativity. Valentine’s Day is only three short weeks away and if you’re anything like me, you’re still trying to figure out what to wear (I always wait until the last minute!). Anyway, here are some really cute ideas to wear for the special night out on the town…or any date for that matter. Valentine’s Day will be upon us before you know it! If you haven’t already it’s definitely time to start thinking about getting that special someone in your life something they’ll remember for a long time. 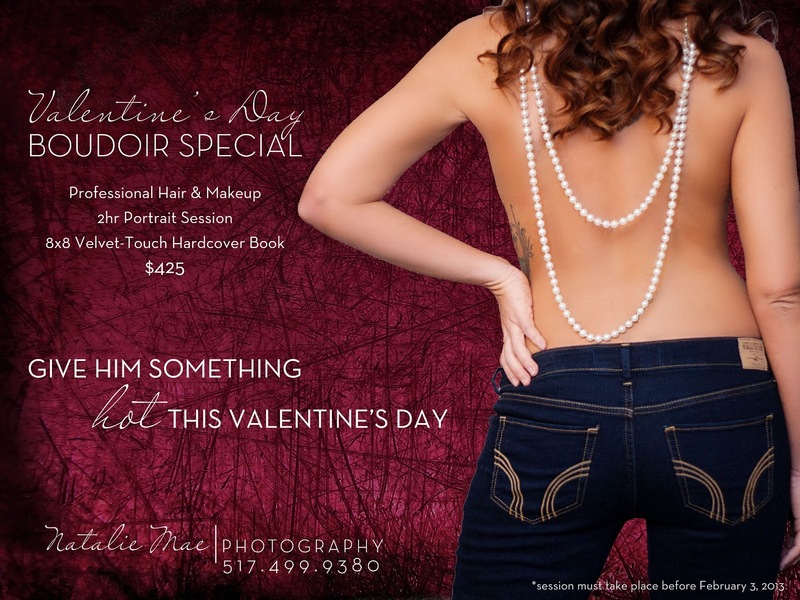 Why not give the gift of boudoir photography? 2012 has been a really eventful year for me! I graduated with my second degree, this time in Graphic Design; photographed some really amazing clients; and did a 360 with the direction of my business. There’s been ups and downs, but what’s life without some bumps?! I am truly thankful for each and everyone of my clients. Every time I get to photograph someone I learn something new and always have a great time. My business wouldn’t be anything without my clients, so I am forever indebted to you for allowing me to pursue my dreams. The new year brings more changes for us first starting with the name change. We were formally known as Natty J Photography, and are starting out 2013 with a fresh look as Natalie Mae Photography. Still, same beautiful portraits and individual customer attention, just with a neater and cleaner looking package. I can’t wait to photograph and get to know more of you in the new year! Until then, here’s my incredible collection of 2012 clients…and once again…THANKS!! When Missy first asked me to do some pin-up portraits for her, I have to admit I was a tad apprehensive because I had never done that style before, but since she’s a really good friend of mine I agreed. These were seriously SO much fun to photograph! We tried all kinds of poses and I have to say I loved every single image, it was so hard to narrow it down, so you guys get more images than normal. We had so much fun that even my dog, Piglet, wanted to join in!